Congratulations to Dr. Julia Laskin, Pacific Northwest National Laboratory, on receiving the Rising Star Award from the Women Chemists Committee of the American Chemical Society. This award honors 10 women in the chemical enterprise who have made outstanding contributions in their fields of study. The committee is presenting the award for this first time this year. It will become an annual recognition. Laskin was chosen for her work in mass spectrometry, much of which was funded by DOE's Office of Basic Energy Sciences. Her fundamental studies of complex ions colliding with well-characterized surfaces built a path for precise experimental control of ion activation and dissociation. 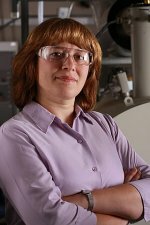 Furthermore, her innovative ion work demonstrated that soft-landing of mass-selected ions is a powerful technique for preparing novel materials and obtaining a molecular-level understanding of interactions between complex molecules and surfaces. Her research on high-resolution mass spectrometry provided key insights on the relationship between the chemical composition of organic particles in the atmosphere and their possible impacts. A new direction in her research is using imaging mass spectrometry for chemical analysis of biofilms in their native environments. This work is part of PNNL's Chemical Imaging Initiative. A well-respected scientist and mentor, she has received several accolades, including the 2007 Presidential Early Career Award and 2008 Biemann Medal for Achievements in Mass Spectrometry. Her advising of students and scientists earned her Department of Energy mentoring award. Research from her peer-reviewed articles grace journal covers. She is often asked to speak at professional societies. Laskin will receive the award at the American Chemical Society Spring Meeting, March 2012, San Diego, California.